Almost a year ago I decided to learn how to crochet. Skip forward to May 2013 and I have finished my first Granny Square Blanket. I’ll admit there was a huge gap where this project just sat in my WIP basket, but a newly purchased Clover Amour crochet hook helped with the motivation to finish! 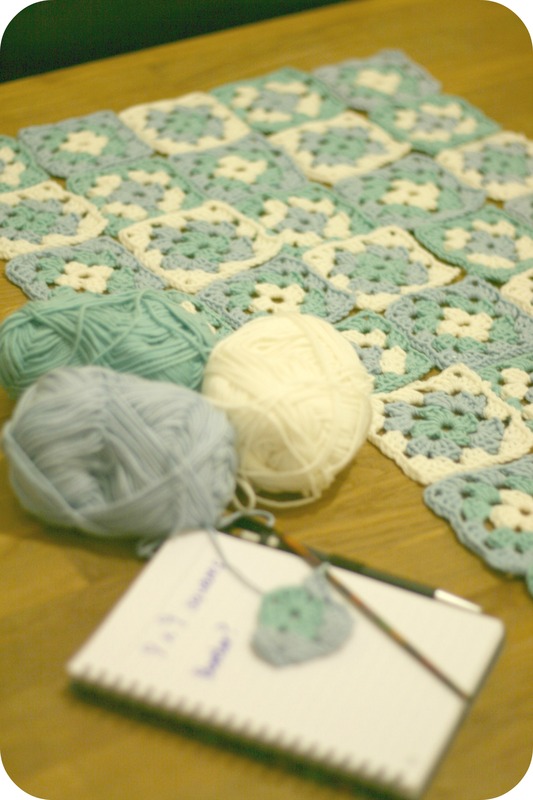 In my first Granny Squares class with NotSoGranny last year, I chose some pretty blue pastel colours in Debbie Bliss Baby Cashmerino yarn and decided that my first ever granny square would be included in the blanket. Here are some in WIP photos…. Not only does this blanket include my first ever granny square, it has also travelled to Canada and back and kept me busy on a long-haul flight where the entertainment system failed. FYI – Air Canada allow hooks and small scissors on board, yay! In the end I went for a different layout to this image and set the coloured squares out in strips. I joined them with double crochet (seemed to take forever!) and then edged with 1 round of dc and 3 rounds of htr (UK stitches). There are definitely messy bits in the blanket, but revisiting it and finishing it off was great, as it highlighted just how much I have learnt in the last year. It’s a lap blanket size so will keep me cosy in my craft room from now on. If you fancy trying your own Crocheted Granny Square, you can find a free tutorial on Ravelry here. It’s so pretty Claire! My granny circles will be a long time in the making …. Great Work Claire! Beautiful colour choices and a lovely blanket.I can’t believe it was only a year ago – I feel like I have known you and been teaching at the sheep shop far longer than that! It’s lovely. You must have a lot of patience to make all those squares! Congratulations – it’s a wonderful achievement. It’s hard to believe it was a learning piece! I love the colours on this! I’m working on a crochet squares blanket (and I have been since last summer) but it does seem to take a long time- I’m on about 60 squares. So lovely! I reeeally want to make one. I have to admit I uttered a few curse words when joining as it took forever! Hello Claire, love the blanket – well done you! The colours are fab. I’ve just gone back to knitting for my adorable granddaughter – seem to have a ‘thing’ about blankets at the moment. Crocheted both my twin a cot blanket when they were born and still have one of them……! It grows much quicker than knitting. Can’t believe Air Canada allowed your crochet hook + scissors on board, yet Aer Lingus made me throw away tweezers + Flybe my emery board! Might have to get my crochet hooks out again after seeing your lovely blanket! It’s a super craft to learn! it’s gorgeous, wonderful colours. I picked up the first granny squares I ever made recently to make them into something, I couldn’t believe how loose my tension was, it was a struggle to make more blocks the same size! My tension certainly changed over this project as I was learning and improving! Well done, I love the colours. I am also working on my first granny blanket but I have only a quarter of it done so far… Actually the idea of having to attach them all together is not really motivating me to finish. Hi, I am wondering how many skeins of yarn (of each color) did you need?